In 2015, the Foundation launched a Capacity Building Series in partnership with Healthcare Foundation of Northern Lake County. Designed as a training forum for small groups of nonprofit staff and board members, 16 organizations and 35 professionals have participated in the series since it began. Training themes ranged from Board Governance to Organizational Leadership, and Fund Development to Marketing and Communications. The co-investment partnership has resulted in more quality training opportunities for Lake County nonprofit leaders. Participants have reported they have not only benefited from customized professional development but also appreciate the peer learning environment fostered within their cohort. This year, The Lake County Community Foundation and Healthcare Foundation of Northern Lake County have partnered with Leading Healthy Futures to offer a Learning Circle series aimed at helping mid-level managers and senior program staff to develop the knowledge and skills to advance their careers toward increased responsibility and leadership. Learning Circles are flexible, peer-directed learning experiences and are built upon the idea that every member has something to contribute and learn. Topics covered may range from strategic planning, budgeting and grants management, to improving cultural competency or working with a nonprofit board. The Learning Circle session will run from July 2017 to January 2018. Participants will be announced in June. We are pleased to announce we will be partnering with Lake County Cares to offer a training series designed to empower our grant recipients with the tools and practices to increase their capacity and impact through volunteer management. Following the workshop series, a board recruitment event will be held to encourage qualified volunteers to join the boards and committees of the participating nonprofits. Additional event information will be made available in July. The Lake County Community Foundation is pleased to provide a curated list of nonprofit professional development opportunities and area consultants for your reference. Included in this guide, you will find information about upcoming regional professional development events, academic courses and certifications, webinars and contact information for local consulting experts. All of the programs and services found in this guide are available regionally or online. Programs have been vetted and consultants have been engaged by the Foundation or one of its contributing partners. Click here to access the latest edition of the resource guide. For nearly 15 years, the Foundation has served as a convener and connector within Lake County. The impact of this important work is perhaps most apparent through the formation of The Alliance for Human Services, a powerful coalition of individuals and organizations committed to continuously improving the quality of human services available in Lake County, Illinois. 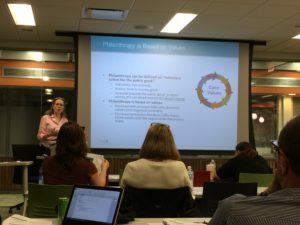 This culminated with a request from the nonprofit leaders that the Foundation actively seek ways to engage the nonprofit sector in creating systemic change. The Lake County Community Foundation launched the Leadership Task Force in 2010. Following the establishment of the Task Force, members quickly identified two key issues affecting their organizations and the human services sector. The agencies had many shared clients, but did not know enough about each other and their shared clients to efficiently coordinate care. Predictable income was becoming increasingly scarce, creating a strong need for sustainable funding. As the Foundation’s largest grant making investment to date, our board and staff remain committed to the coalition’s success and continue to support the Alliance as members and strategic partners for advancing key initiatives throughout Lake County. For more information or to apply to become a member, please click here.